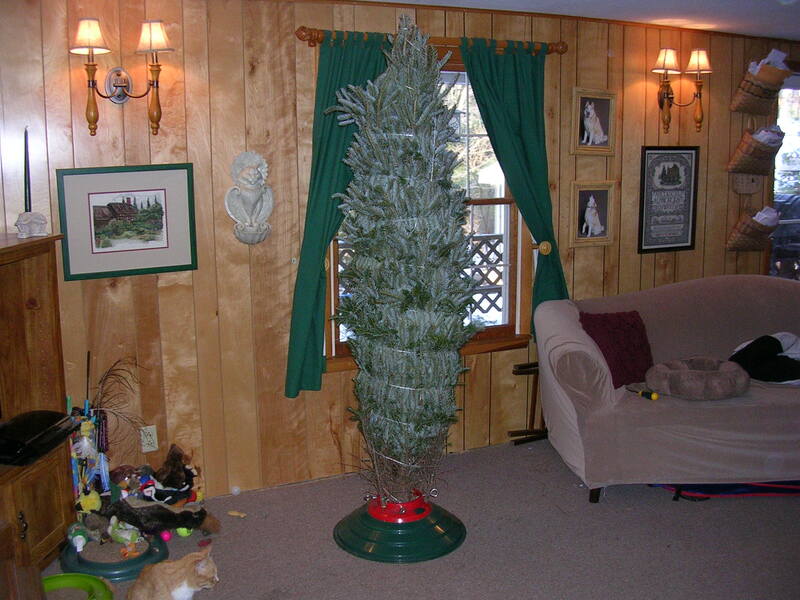 My wife, who is non-Jewish decided that we should, for a change, get a real Christmas tree. “Sure.” I responded as if I had a choice in the matter. 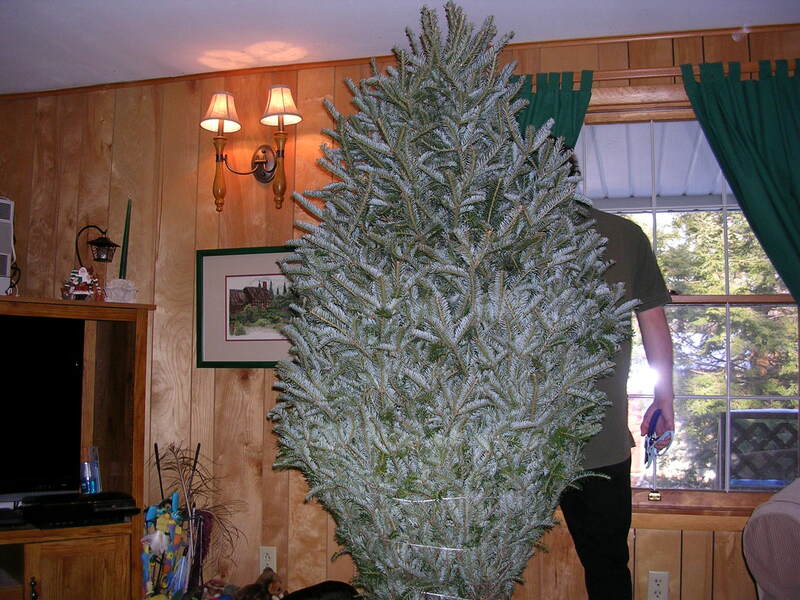 A few years ago we did spend a gazillion dollars and thirty-seven cents on a fake pre lit Christmas tree. We spent a gazillion dollars and thirty-seven cents on the fake tree because they last forever, in theory we would never have to buy another tree again. So off we went to Tannenbaum farms to get our first real live Christmas tree. It turns out Tannenbaum farms is a pretty big deal. Being a rather nice day the snow was melting creating a horrid mess of the ground. We were directed to a parking spot, my wife and I, (both in running shoes) parked the car in the mud, looked at each other, took a breath and the adventure began. The scene was frightful, Children running around screaming, fathers grunting and mumbling under their breath while trying to negotiate the muddy rutted road with their freshly cut tree hanging off the rickety dolly, I was worried about the orange hack saws they wielded, were the hack saws for the trees, or the rest of the family? Mothers were trying to coral their over excited children, dogs were slopping around, I can only imagine our woolly coated husky covered head to toe in mud, although she would have enjoyed the chaos I am glad we decided not to bring her. My next thought was, ‘now what?’ Everyone seemed to know where they were going and what they were doing, but to me it looked like a chaotic free-for-all. My wife managed to find the little office and explained to the man who looked like he wanted to be anywhere else than where he was, (he was wearing a paper crown that his daughter had made for him) that we had no idea what we were doing. “And you are asking me?” he replied. He did do his best to put some order to the chaos. He took us to the door and pointed towards the mud and told us that down near the road were some sample trees. All you have to do is find one you like and ask one of the guys in overalls where that type of tree is located. The overall guy will then direct you to the part of the forest where that type of tree is grown. Then you get yourself one of those little saws and a rickety cart. Cut down your tree and bring it back here where we will wrap it up for you. All trees regardless of size were $35.00. I had a horrific vision of walking for miles in the mud deciding on a tree then getting down on my knees with this little saw to cut down a five foot tree. I really wanted my chain saw and I really didn’t want to crawl under the branches in this muck to get to the trunk and cut down a tree. What I wanted was to go into my garage and get our gazillion dollar and thirty-seven cent pre-lit fake Christmas tree. But it was far too late for that. “Or” the man continued you can go over to that fence over there and choose one of our pre cut trees. He explained that because they cut them they would be a little more expensive but they were all freshly cut that morning. My wife and I glanced at each other, two souls one thought. Expense be damned! Show us to this wonderful magic fence! At the fence there was another man, okay a man-child who asked us if we needed help. “Yes 5 foot, narrow yet full.” He showed us a really beautiful tree but it was a little wide. The next one was perfect. He looked at the tag and told us it would be $55.00. I didn’t care! My wife went to pay for the tree while the nice man-child hefted the tree into the air and walked it to the office (no rickety little cart through the muddy rutted road for this Jew). Behind the office were two large machines one was a box like thing that he stuck the base of the tree into when he flipped a switch the entire tree started to vibrate like mad. All the loose debris came flying off the tree, along with any bugs, birds, rodents, hawks and a nest of children in a tree houses. Nothing could survive that shaking. Once my man-child was satisfied he took the tree and put it through this other machine which ‘folded’ for lack of a better word, the branches and contained them in twine turning my full tree into a large manageable toothpick. He then offered to put the tree into our SUV. While I desperately wanted him to lug the toothpick across the muddy road to the car, (all of 20 feet) I thought it would be best to keep a little dignity and handle it myself. Twenty minutes after we got out of the car and $60.00 later (yes my wife wisely spent an extra five on a watering tube that has made life easier, did you know that a live Christmas tree drinks about a gallon a day?) we were heading home. What we didn’t think about was the sap. I got out my chainsaw and cut a ‘cookie’ off the bottom of the tree as directed by my wife who looked up ‘care and maintenance of a Christmas Tree’ online. We hefted the tree placed it in the tree holder clamped it down so it was plum and cut the twine. Our beautiful tree unfolded to its former glory. 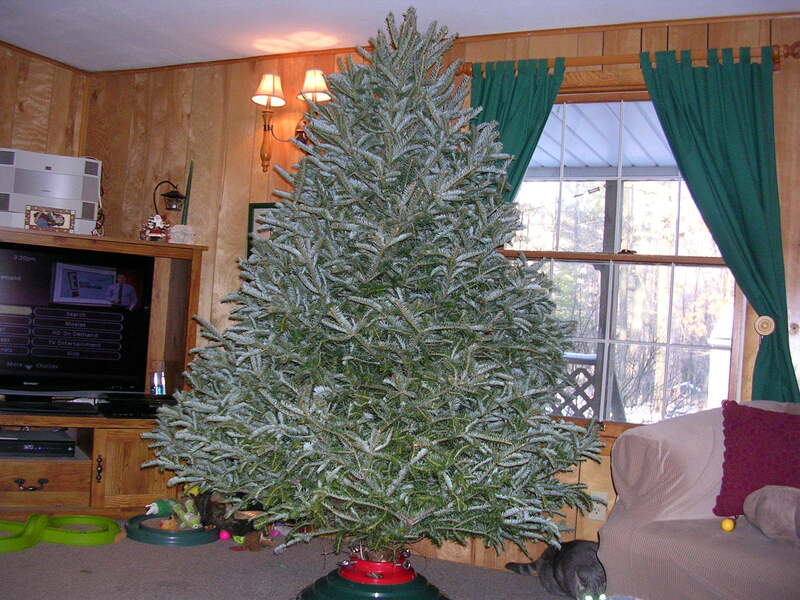 The aroma of pine enveloped our house, we sat back and admired our tree, yes we have 11 wooded acres, yes we planted three fir trees in our front yard but we have never had a live tree inside. And even I, the Grinch of all things holiday (except Halloween) was very pleased with our tree. My hands were sticky. My wife’s hands were sticky. My wife went to wash hers. Five minutes at the sink and panic started to set in. My wife who doesn’t mind handling all sorts of unmentionable and gross stuff at her work, my wife who has a degree in meat science, my wife who has worked on a kill floor skinning and eviscerating carcasses doesn’t like sticky stuff that doesn’t come off, meaning…sap! “Brian!” I heard the panic in her voice. “It won’t come off, do something!” I searched the cabinet and found Goo-gone. Thankfully that worked and a full blown panic attack was narrowly avoided. Hands all nice and clean and protected behind latex gloves the decorating of the already beautiful tree began. Earlier, months earlier my wife said, “I want a real tree this year”. “Okay” I said, as if I had a choice. 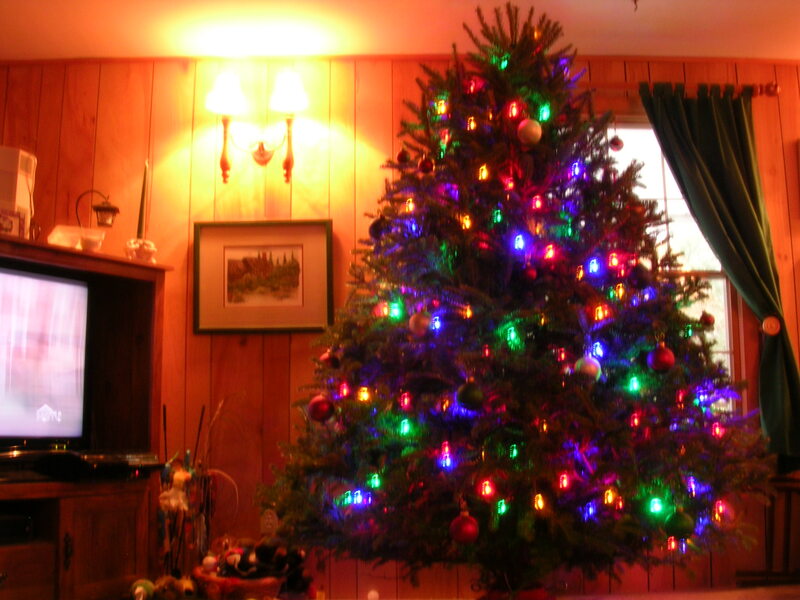 “What colour lights would you like on the tree?” She asked. “Don’t care, I’m Jewish.” I replied. Long pause, a bit of laughter from us both. As you can see the tree is not yet fully loaded, but you get the idea. I don’t like painting, actually I don’t like the prep work or the clean up. Fortunately they have made technological leaps and bounds in paints since I’ve last painted. We got a paint with no VOC (Volatile Organic Compound) so it doesn’t have that toxic smell. Paint also dries quicker, perhaps it is just me but the paint itself makes less of a mess. For the most part you don’t have to use primer, the good people who manufacture the paint now found a way to mix it all together. But as we all know, you cannot have a light without a dark to stick it in. First you have to move everything, sand and clean the surfaces then tape everything you don’t want painted, put plastic on the floor. It is tedious work that takes forever. Eventually you get to paint. An hour later you have to clean it all up. It is frustrating that the main event takes the least amount of time. Is everything like that? Could very well be. Even though they mix the primer in with the paint there are certain surfaces that you simply have to prime first, and of course, we had two such surfaces. Unlike paint, primer has not made such leaps and bounds in technology. Not only is it messy, it stinks. If you ever find yourself asking, hmm I wonder what they did with all that VOC in paint? The answer is, they put it all in the primer. Now you have done all the tedious prep work, you have messed up the brushes and the rollers you have white crap on the walls, on your hands, your clothes, your hair! You have to clean it all up and YOU STILL HAVE TO PUT PAINT ON THE WALL! Talk about injustice. Volatile Organic Compound. I don’t recal ever having a headache that bad, I couldn’t move my head. I’m not a hypochondriac but just a few days before we painted I saw that Gary Coleman died from a brain hemorrhage! After listening to Brett Micheals talk about his near death experience due to a brain hemorrhage I was reasonably sure my brain was bleeding. I was wrong of course. But it was bloody painful. I don’t like flying, but like painting, it didn’t take me long to figure out it wasn’t the flying, it was the airport. The packing, the trip to the airport, all the people running around like bees in a hive, finding the ticket counter, checking luggage, security, finding the gate it is all too much. Once I’m on the plane I’m fine, I don’t have fear of flying I can’t control what happens so why worry about it? I take two Benadryl (because two puts me to sleep) So I snooze, watch a movie, eat and sleep a little more. What could be better? In the end the airplane got me where I wanted to go and the room is looking great. While you can’t have a light without a dark to stick it in, it’s all good once you can finally turn the light on. Sixtieth post and what have I learned? Positive might be better than negative, but negative is funnier than positive. You can lead a horse to water, but you can’t make him drink. Meaning, you can write whatever you want, however you want, but people are going to take away from it what they want, and interestingly enough, that’s a good thing. Ten posts ago I could not think of anything to write about. There was a period of posts where writing was like pulling teeth, I was pretty sure I was done. Now I feel like I can write forever. Forever isn’t all that long. Sometimes my posts are technically difficult to write, other times they are emotionally difficult to write. I’m not sure which I prefer, but I prefer either one of those to the posts that are both easy and un-emotional. I don’t like the prep or the cleanup, the actual task is never all that bad. I pay way to much attention to my stats here on WordPress. HGTV is great, but it is never as easy as they make it seem. No matter how tired my wife is, if the right song comes on the radio, such as ‘Play That Funky Music’ she can paint, wiggle and sing at the same time (at least for the duration of the song).